Hidden object games or HOGs are usually thought of as casual experiences that mix some items hunting with light story and gameplay. While this is true for a lot of them, Artifex Mundi has gone a long way towards advancing the genre over the years with a variety of releases on console and PC. These games typically combine point-and-click adventure elements with HOGs and pretty unique stories/settings. With the release of their new horror adventure, Dark Arcana: The Carnival, I had to see what kind of puzzles and adventures they had in store for us this time. Ultimately, does this game provide a well-rounded experience for gamers looking to get a light horror fix, or should this carnival be kicked out town? Time to find out! The storyline of Dark Arcana begin with the disappearance of a woman during a carnival. This sparks an investigation where the main character, a detective, begins to search for clues in the admittedly creepy carnival. What she doesn’t know, is that this carnival hides a dark secret. Chasing answers quickly leads the main character to discover another world parallel to our own. Here, the carnival is represented through a lens that almost lovecraftian in its cosmic horror. An already unsettling environment becomes downright scary as structures are replaced by grisly set pieces and shocking imagery. Hidden object games rarely go this dark, and the story doesn’t stray too far from some pretty intense themes as well. It feels more mature and horror-focused than most of its contemporaries, and that helps Dark Arcana: The Carnival, stand out from the other HOGs that have released recently. The twists and turns, along with the jump into the mirror world, all make for a solid horror story. My only complaints would be the stiff animation and lip sync on the characters. Their voice acting also leaves a little to be desired. Even so, fans of the genre will still get a lot of enjoyment out of the story here. When you finish the main portion of the game, you’ll also unlock a “final chapter” that wraps up a few loose ends from the main story. So, despite some rough patches in the delivery, the overall story here is quite good, and manages to stand out from other games in the genre. These types of games are commonly played on PC because they require a cursor that’s best controlled with a mouse, but in recent years, developers have found ways to make the classic point-and-click adventure and HOG work well on consoles. Artifex Mundi takes an approach here that gives you a large circle shaped cursor. The wide range of the cursor ensures that you won’t have to move it far to reach any part of the screen. Additional tools, like the handy monkey companion, Miles, your inventory, and the hint system, can be found on the d-pad for easy access. There’s a lot of smart design choices in play as well, like the requirement to hold the button down when you’re transitioning to another area. This ensures that you don’t accidentally click out of a space while exploring. 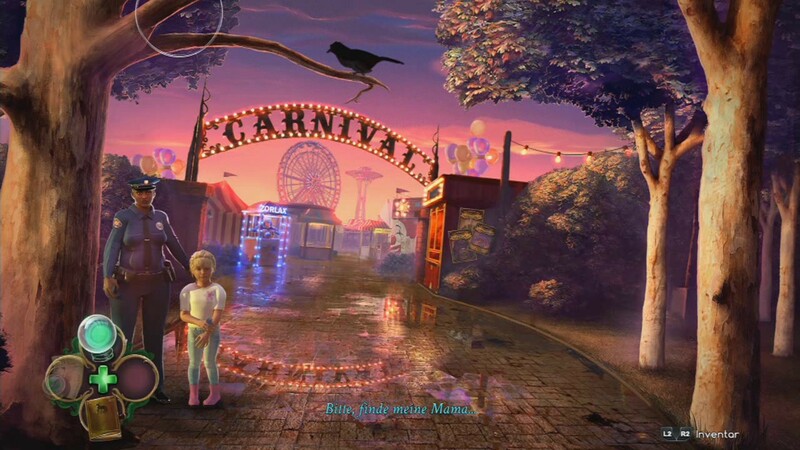 Beyond this, the puzzles and hidden object games in Dark Arcana: The Carnival, are really well done. While you may not find that they challenge you to the extent of other puzzle games, they have a nice flow and a cohesive way of fitting together. While some of the tasks, like collecting rings or masks to solve a larger puzzle, can be somewhat tedious, the satisfaction of solving a series of steps is always satisfying. 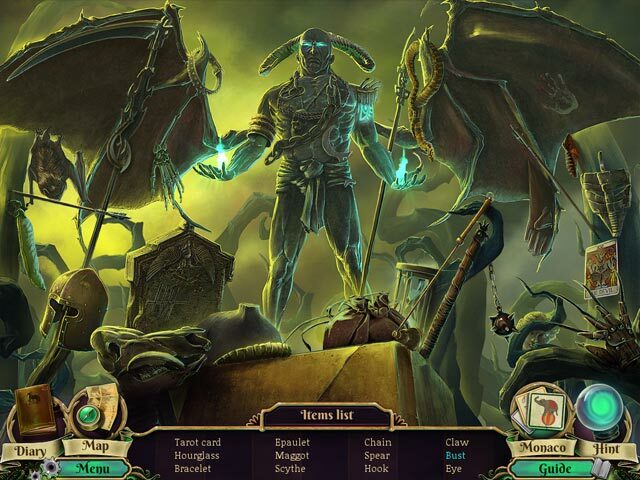 The hidden object games, while reused on several occasions, offer a good mix of spotting items and combining objects to create something you need from your list. You can also play an alternate minigame if the hidden object puzzles aren’t your thing, which is a great touch for those who aren’t fans of hunting for items. The only other complaint I had, was some issues with translation. Some items went by odd names like “Windfall” for a victorian style hand fan. It only resulted in some mild confusion, nothing that took away from the experience. While it may not be exceptionally challenging, I really enjoyed my time with Dark Arcana: The Carnival’s puzzles and the hidden object games were fun to solve as well. In terms of presentation, the backgrounds and art in the hidden object games are absolutely stunning. The amount of detail to each scene is excellent, but this causes the character models and animation to stand out. Anything that moves like Miles the monkey, the main characters, and even the bad guys all have a awkward movement to them. It’s only really noticeable when characters are speaking, as the lip sync and facial animation fall pretty deep into the Uncanny Valley. Even so, that doesn’t stop the story from being interesting. It’s just a shame the characters don’t hold up as well against the excellent backdrops and art style. If you’re not a fan of adventure games, and you don’t like the idea of hidden object puzzles, Dark Arcana: The Carnival isn’t going to make you a believer. That being said, if you have even a passing interest in these types of games, this is one of the best ones I’ve played in the casual adventure game genre. Dark Arcana: The Carnival may take place in a mirror world, but it’s reflection doesn’t quite match anything else I’ve seen in the genre. For that reason alone, it’s well worth your time.